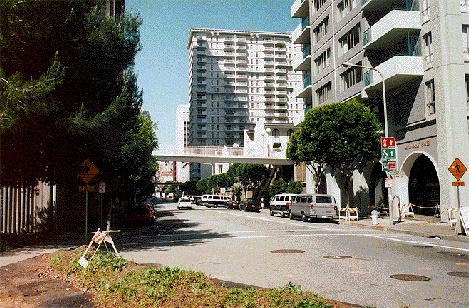 In the foreground of this 1995 picture are the remains of the old Washington Street exit from the Embarcadero Freeway, now demolished, and the Golden Gateway Apartments, one of the first Redevelopment Projects in San Francisco. The edge of the white building at end of street (just left of apartment building) is the same as the Immigration building in photo below. 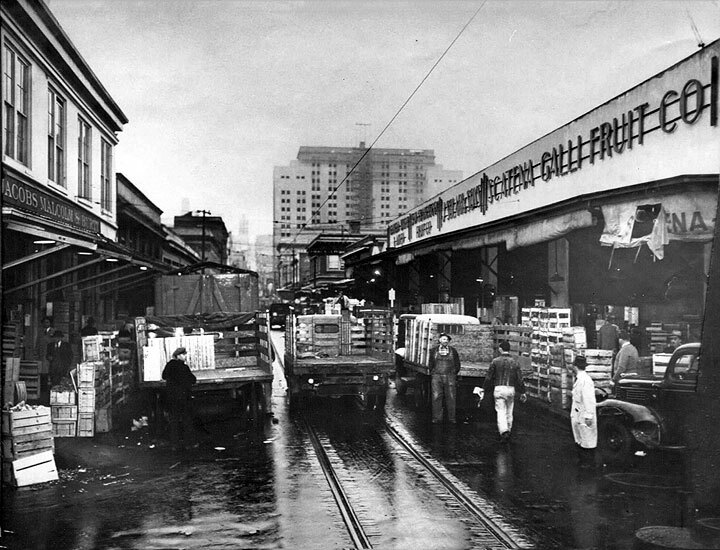 The old Produce Market district with the federal building housing the Immigration and Naturalization Service on Sansome in the background. Removing the old Product Market to make way for an expansion of downtown development was the first major project of San Francisco's redevelopment process. The heart of Italian San Francisco was gutted by this process, and the decades-long life of Italian immigrant families and the food industry was permanently altered. 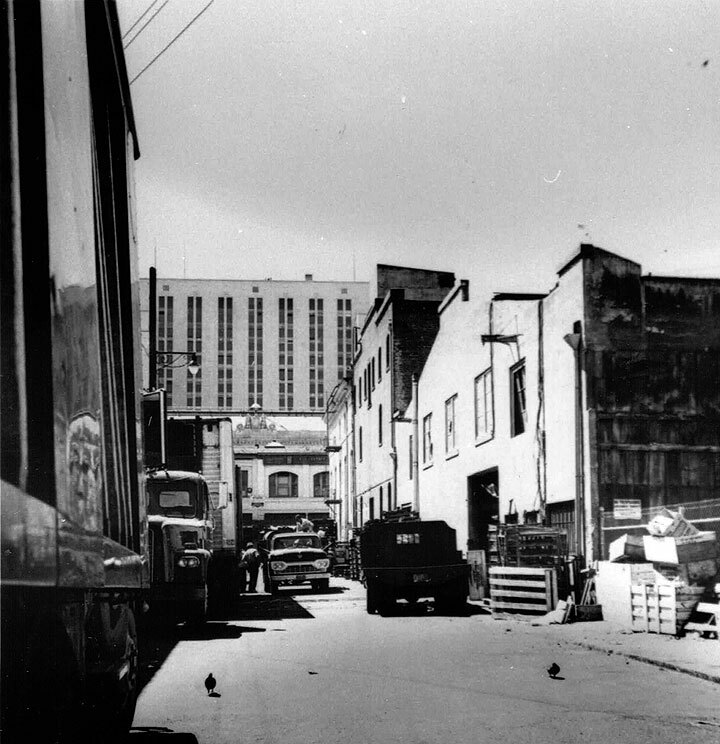 View westerly on Jackson Street, INS Building looms, c. late 1950s. 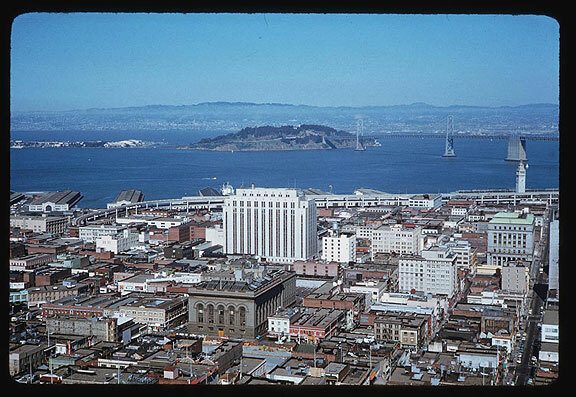 The Old Hall of Justice on Montgomery Street sits closer to this view from the Fairmount Hotel on Nob Hill than the taller white INS building on Sansome, April 22, 1962. The Embarcadero Freeway curves along from the Ferry Building at upper right to its then-terminus at Broadway.